Now for the rest of the goods! These boxes normally delivery 5 hits per box. We got a whopping 7! My favorite has to be the Mark Grace card which features a piece of ball used during Game 1 of the 2001 NLDS (Cards/DBacks). It was nice to see the Wicked One get on the board with some Marlins. Hopefully, we’ll see the love spread even more in our final box. Don’t give up guys. EDIT: Sorry guys, I will have to wait until tomorrow night to post the results. 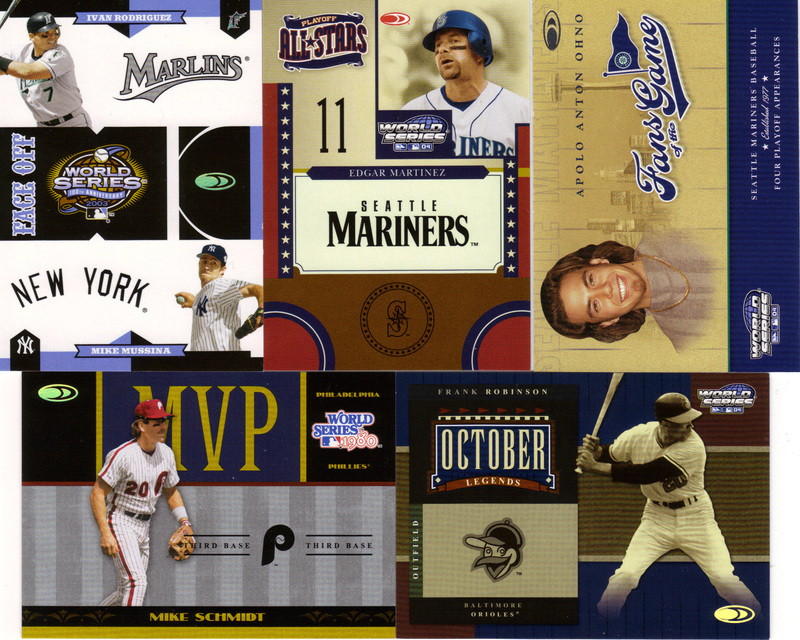 For my first box break in over 2 months, I decided to go with a box of 2004 Donruss World Series, a product that delivers a multitude of hits in each box and pays tribute to Fall Classics of the past in each pack! 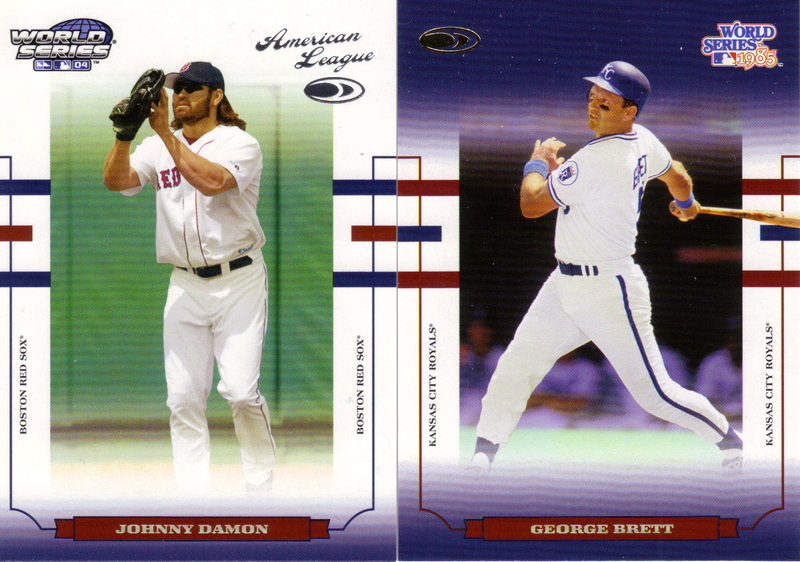 Base set: The base set is comprised of 175 cards and contrary to what the name might say, features players from all 30 Major League teams. 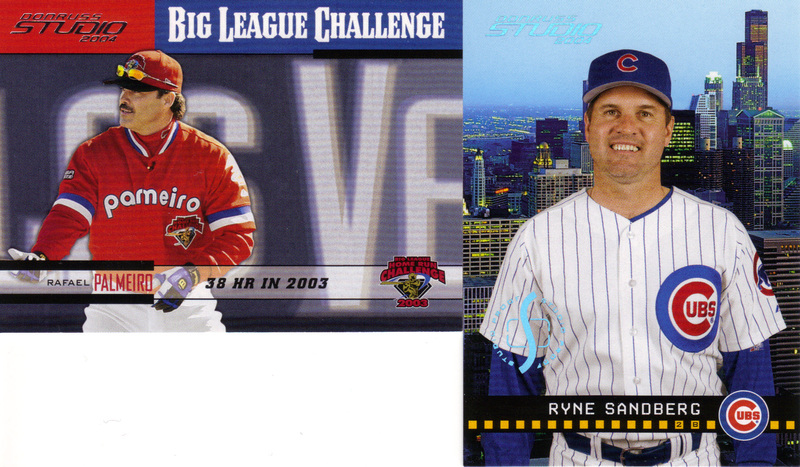 The front of each card bears the logo used for the 2004 World Series and lists the name of the player’s league. The back of each card lists the player’s 2003 stats and includes a small blurb about their career. These cards are followed by 25 signed rookies, numbered to 1000 or less. I pulled 110 of 175 base cards (63%) without any duplicates. 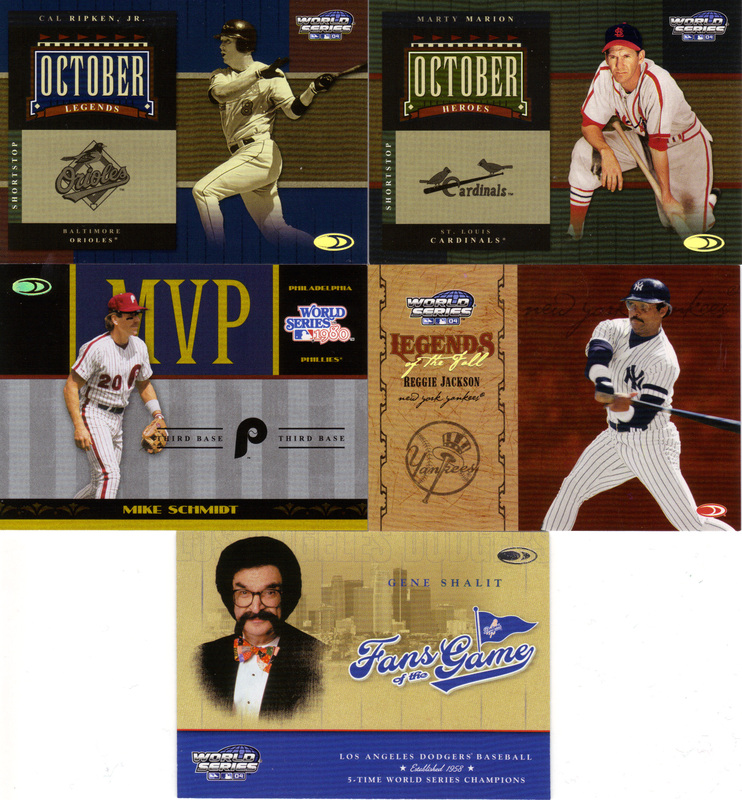 Blue (100 cards, 1: pack): Inserted at a rate of 1 per pack, the World Series Blue set is filled with players who have contributed to a World Series-winning team. The blurb on the back describes each player’s postseason heroics and is accompanied by their stat line for the given Series. 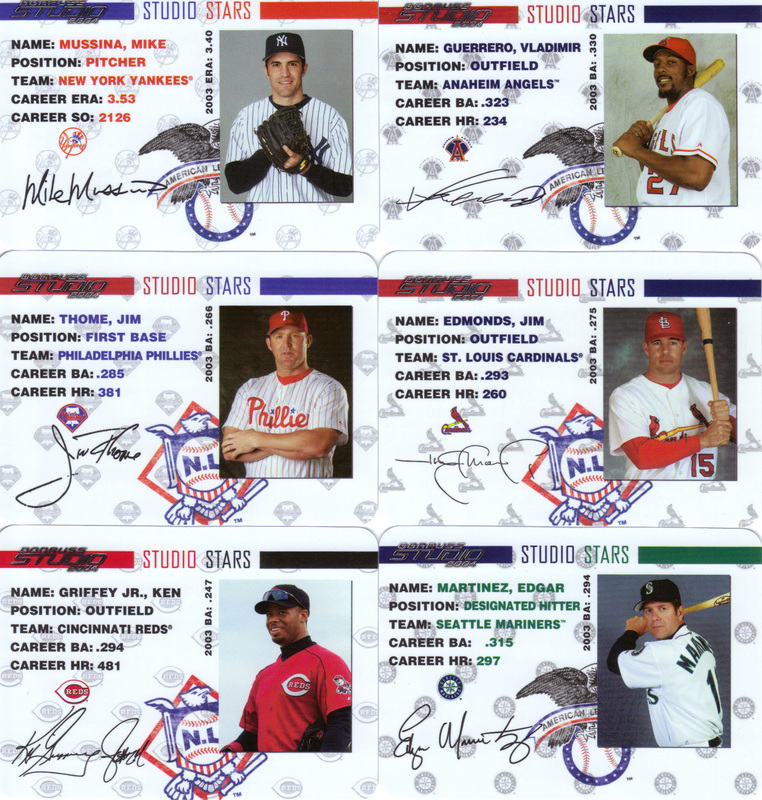 A handful of players (Canseco, O’Neill, Morris, R. Jackson) appear in the set twice. I pulled 24 different Blue cards in this box (again, no dupes!). My pulls included Mike Schmidt, George Brett, Steve Carlton, Cal Ripken, and Willie Stargell. Holofoil Parallels (varied numbering): All 175 base and 100 Blue cards are mirrored by 4 different specially colored (purple, silver, gold) holofoil parallels. These parallels have print runs of 100, 50, 25, and 10. I pulled an Eric Chavez (009/100), a Blue Tim Salmon (12/50), and a Barry Zito (10/10), that I honestly didn’t even know I had until I thoroughly went through the base cards. The inserts’ names speak for themselves so I’ll just list them. 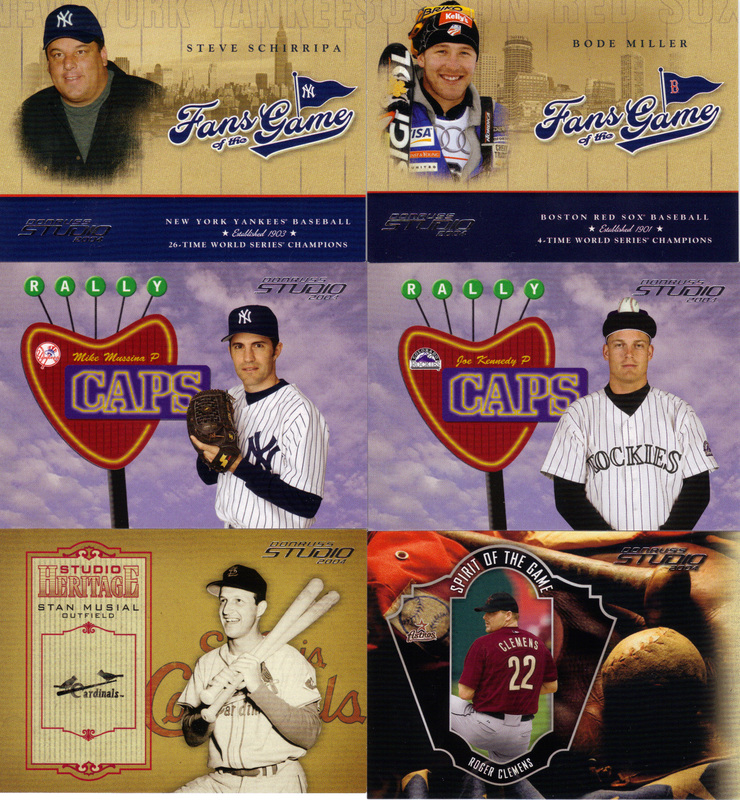 As far as “hits” go, there are autographed and/or game-used variations of all 175 base cards, as well as the 100 Blue cards. The box states that inserts fall in every other pack on average. I pulled 13 altogether AND I had no duplicates. It doesn’t get any better than that. Overall, the cards came out very clean with the exception of some noticeable scratches/dings on a couple of base cards (I even mentioned an example of this in the video). Let’s face it. There was nothing too exciting about this box. The George Foster pull was nice, but a different color ink would’ve made the card a little nicer (as would the lack of a sticker, but this is Donruss after all). Ochoa has only 1 big league season under his belt, 2005, when he hit .200 for the Giants. Everything will be available for trade. The price on these boxes has finally come down to the $100 level, a good $30-40 lower than their original cost. 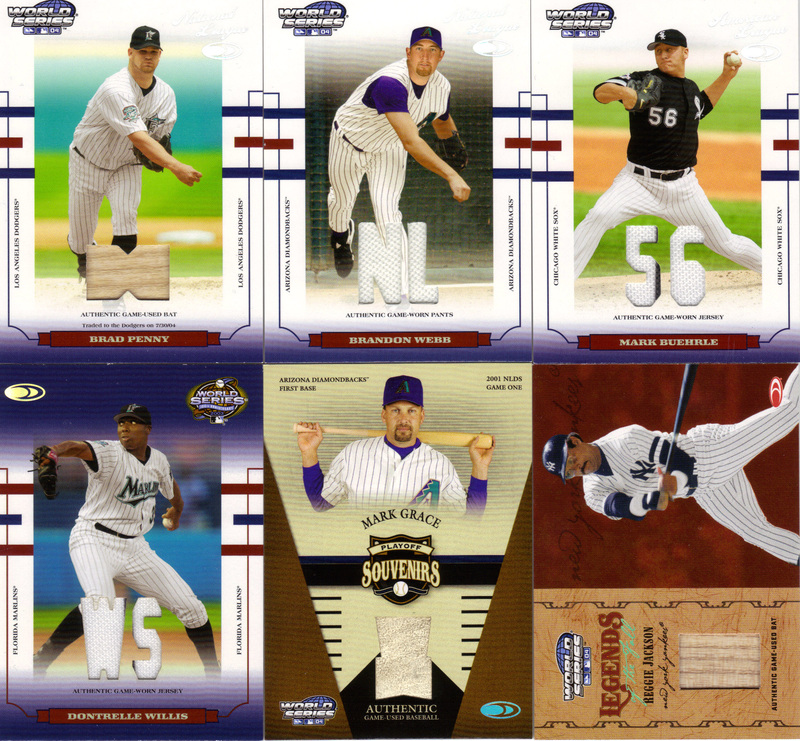 You can certainly do a lot worse than a dozen inserts, five of which are hits, for $100. However, it is important to remember that a product offering so many relics will contain lots of filler, as was the case with this box. Still, with an autogamer checklist as impressive as this product has, it’s probably worth a one-time shot. The full review and scans will be posted Thursday evening, but for now, enjoy! Here’s the link because for some reason, the video won’t embed properly.